It’s oddly ironic that Frank Capra’s 1946 film “It’s a Wonderful Life” was released by his production company Liberty Films. For the film and the opera, revised from its 2016 premier, both look at freedom as seen by an American Everyman who wants to rid himself of the shackles of small-town living and capitalist venality, and live a larger, grander life. A life he has freely constructed out of his imagination and idealism. The opera version that opened this Saturday at San Francisco Opera’s War Memorial Opera House is a lighter and more shimmery take on Capra’s grittier post-WW2 black-and-white film. It’s clearly holiday fare. 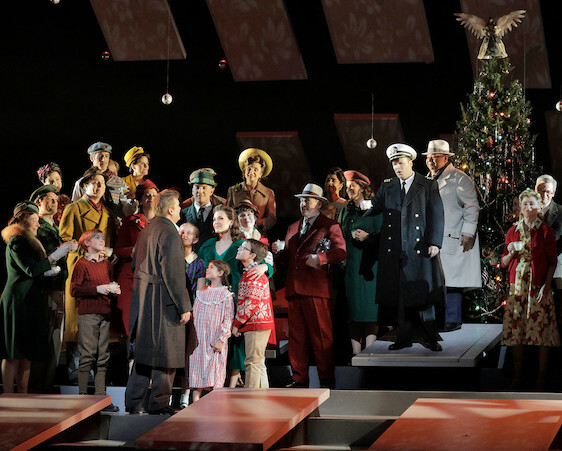 Golda Schultz as Clara (suspended center) and William Burden as George Bailey (standing center) and Sarah Cambidge, Amital Pati, Ashley Dixon and Christian Pursell as Angels First Class in Jake Heggie and Gene Scheer’s “It’s a Wonderful Life” at San Francisco Opera. Photo by Cory Weaver/ San Francisco Opera. While both versions are unrelentingly sentimental and moralistic in a homespun American way, the opera strives for a more pleasing and sleeker presentation. 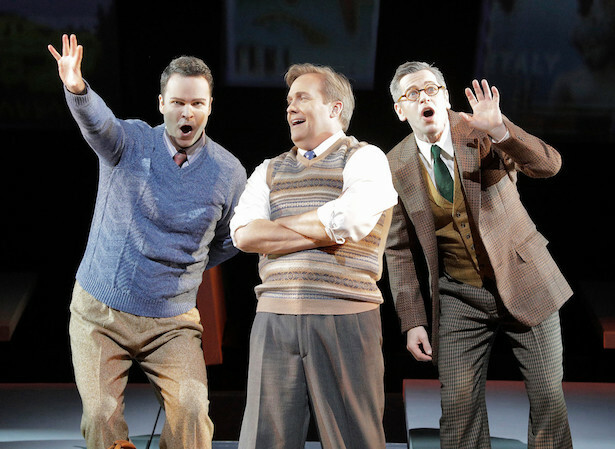 Librettist Gene Sheer shaves away the script’s anachronisms. In the film the heroic George Bailey calls the bumbling angel Clarence, “bub”. Our operatic George, sung fervently and openly by tenor William Burden, is more genteel, and the entire opera’s libretto lacks the quaint manliness of the original. As does the character of George, thankfully. Though the original gender identities are kept intact, with college-educated Mary wanting nothing more in life than to be a loving wife and mother. Best to keep the setting in 1946. The opera opens with a video projection of sparkly snow falling across a bright blue background, the title written in script, which dissolves in a snow-like flurry. Composer Jake Heggie’s overture has all the gusto and swash of film credits music. When the scrim goes up, though, we are in the world of theater. 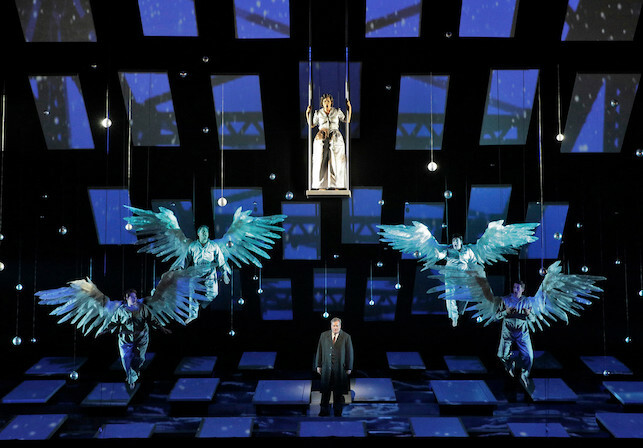 With a grid of panels jackknifed in the night-dark stage space and a singer in silvery togs suspended on a swing, four winged performers also suspended and wrapped in silver and shine. O blessed theater that allows such unabashed glitter! Twinkling glamor, seductive and beautiful, appealing not only to the eye but also to the heart. The presence on the swing is Clara, Angel Second Class, sung by the miraculous Golda Schultz, Soprano First Class. Impelled by the voice-over of Patti LuPone in her role of Goddess, Clara and the angelic SATB crew, sung by Adler fellows Sarah Cambidge, Ashley Dixon, Amitai Pati and Christian Pursell, descend to an attic where the grid of panels becomes doors, each opening onto a day in the life of George Bailey. Clara’s brief is to save the suicidal George Bailey and earn her angelic wings. From there on you know the story. As per usual the singing at SF Opera was a delight. Canadian soprano Andriana Chuchman sings Mary Hatch, George’s wife, and she was especially compelling at the end of the first act in her confession of love in the closing duet with tenor Burden. Pure but warm, the tones in her upper register floated as delicately as snowflakes on a windless day. Rod Gilfry is imposing as the evil Mr. Potter. Even singing from a wheelchair, his voice held forth, edged with malevolence. Tenor Keith Jameson sang the distracted Uncle Billy, repeating Capra’s “oh boy oh boy oh boy” film script with more resonance. And baritone Joshua Hopkins vividly sang George’s brother Harry, who lives out George’s dreams of college and adventure. Patrick Summers conducted. Leonard Foglia directed, and the acting was excellent throughout. Consciously or not, Capra’s film addressed the losses of young men and women returned from war and facing trials of loss and reintegration on the homefront. Ours is a changed world, however, and we can ask how well can we accept such a melodramatically black-and-white world of values. Heggie and Scheer did well to emphasize the themes of community and friendship that are central to Capra’s film. It gives credit to idealism and honors kindness as an antidote to the narcissistic greed of capitalism and the current ills that loom in our government’s immigration policies and our endangered social services. As part of its outreach San Francisco Opera has put into place community-based campaigns for Community Housing Partnership (chp-sf.org) and Compass Family Services (compass-sf.org), two nonprofits working with the homeless. The campaign continues through December and can be found at sfopera.com/ EarnYourWings. It’s a Wonderful Life continues through December 9. For tickets and information, visit sfopera.com.